Ajay Sharma did his graduation in Chemistry, Zoology & Botany from Jammu University and then did his MBA from Punjab Technical University, Jalandhar. He also did a 15 days course in Pest Management & Fumigation from Indian Grain Storage Management. After that he worked with a Pest Control company for 4 years. In 2013, he founded a Pest Control Company called Pest Control Professionals. Pest control is the regulation or management of a species defined as a pest, a member of the animal kingdom that adversely impacts on human activities. 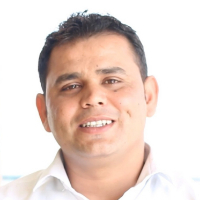 "After completing my MBA, I did a 15 days course in Pest Management & Fumigation from Indian Grain Storage Management. After completing my education, I worked with a Pest Control Company for 4 years. In 2013, I founded a Pest Control Company called Pest Control Professionals."